They did, however, make the best possible start, exploiting one of the few penalty decisions that went their way. After kicking to the corner and securing lineout possession, their pack forced their way over the visitors’ line, with lock forward Tom Lane getting the final touchdown. This positive opening was soon forgotten as the opposition quickly equalised with an unconverted try and then added two further tries, one of which was converted, to power ahead with half an hour played. Leamington have plenty of craft and creativity in their locker and in one very promising attack, Rich McKowen broke clear, linking with Tom Greevy to try to open up a path for winger Josh Jones to utilise. The attack seemed to have petered out when Sils regained possession. However, under pressure from Jones, they dithered in defence and conceded a penalty which Tom Jewitt converted to bring it back to 17-8 at the interval. The second period opened with two quick tries for the opposition and with plenty of time on the clock, it looked as though Leamington were in for an uncomfortable ride. The introduction of Nathan Batchelor had an immediate and positive effect for the hosts as his robust tackling knocked Sils off their stride. The visitors did add two further breakaway scores and were now content to sit back and defend their healthy position. This allowed Leamington to expose one or two defensive frailties. 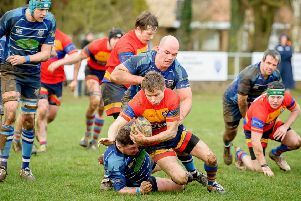 Centre Rich McKowen cut through Sils’ defence and set Chris John up for a try in the corner and skipper Craig Smith then opened up the visitors’ defence with a break which culminated in a lineout for his side. 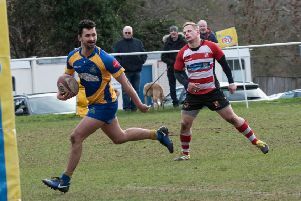 Ali Weedon secured the ball and the Leamington pack drove through the Sils line, allowing Batchelor to add the third try. A bonus point was now looking a distinct possibility for Leamington. However, with the clock ticking, Sils held out.